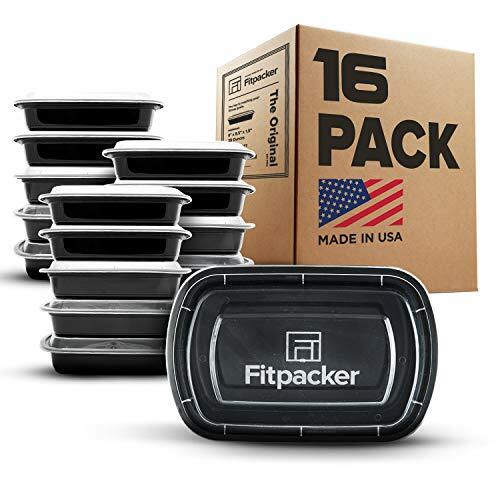 IDEAL FOR MEAL PREP AND PORTION CONTROL - Many meal prep containers may look similar but they won't match the Fitpacker quality. Each container is the perfect size to manage your portions and help you to a healthy diet. MADE IN THE USA - Safety should be a priority when it comes to food storage. Our FDA approved plastic containers are certified BPA free and free of phthalates or any toxins. FULLY REUSABLE - From FREEZER to MICROWAVE (no lid) to DISHWASHER, makes your meal prep easy so you can focus on what is important - enjoying your food. CONVENIENT - Patented SureLock seal clicks into a close for leak resistance and fit perfectly in our Fitpacker Bags. These containers can also stack and nest together for space saving storage. HAPPY CUSTOMERS - 100% SATISFACTION GUARANTEED or your money back. Our customer reviews speak for themselves and assure you your complete satisfaction.